Surprise, surprise... HR still hates outsourcing. Is its next victim RPO, or will it get trumped this time? I feel like we've been here before. Oh wait - we have! Remember the heady old days of HR BPO, when a couple of hundred enterprises shifted multiple HR functions over to service providers, with the hope of saving money and - perhaps - find a few smidgens of improvement with their HR strategy? While a couple of service providers failed to get their delivery model right and ended up losing money, HR executives screamed from the rooftops to ensure every single negative view of HR BPO was expounded in all the HR media, and anyone else who would listen. They got their wish, as firms such as Convergys and Hewitt got crucified by Wall St, and most of the providers made a hasty retreat from the business. In fact, it proved such a grueling experience for Convergys, it recently jettisoned one the industry's largest HRO businesses for loose change. Now enter the latest threat to HR: Recruitment Process Outsourcing. And this time, our HR friends will have to try a lot harder to throw this one under the bus. Firstly, most of the providers in this space have been dealing with recruiting for years, and, secondly, the newer providers have been getting their feet wet with a host of successful pilots and early client engagements, which our forthcoming HfS Research report will discuss at greater length. And thirdly, these providers are fulfilling a badly-needed service for many enterprises today: helping them source new pools talent, get a handle on managing the talent pipeline, access new recruiting technology and social networks, while helping drive out cost by running various back office recruiting tasks offshore. HR executives need help and should consider transferring part of its recruitment function to an external service provider. The more leg-work they can offload, and the more help they can receive to develop the talent pipeline, and the more time they can actually devote to strategic functions, such as spending more time understanding the needs of their internal hiring managers and facilitating ongoing staff development initiatives. Recruiting smartly is about engaging outside help that can infiltrate marketplaces effectively to get the best results - not too far removed from a PR agency which can engage markets with added expertise, technology and canny use of social media. HR trying to perform all of its recruiting inhouse is like marketing doing all their PR work internally. No CMO worth his/her salt would really contemplate running all of its PR internally these days, unless it was a very small activity that didn't warrant outside help. 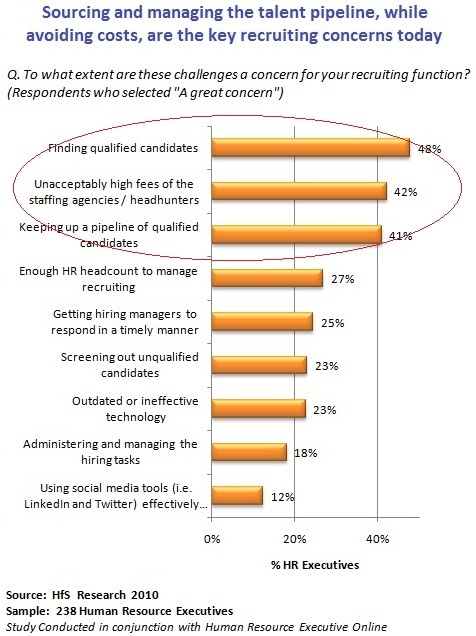 So why should the SVP of HR be any different, when it comes to running recruiting? Other business functions have all resisted outsourcing in the past: IT, finance, procurement, claims processing, clinical data analysis etc. However, once staff and managers got used to working with outside help and expertise, and realized it was a vital part of their team, most have accepted that it is a way of life for today's organization. So why is HR so different that it has to try and run everything itself? Emerging from the Recession, the focus on developing new talent has never been so intense - especially in increasingly globalized markets where it's getting harder and harder to manage the recruiting pipeline on tightening budgets. If HR leadership fails to seek the help it needs soon, it may find decisions being made in corporate meetings, where the SVP of HR isn't even invited. The challenge for RPO providers is clearly to find avenues of communication with operational leaders outside of the HR department. This little outsourcing saga has a few cycles yet to run, and is likely to have a major impact on the way companies approach their talent management in the future. I can't see HR wanting to implement RPO given that having a recruitment process outsourcer removes some 20-50% of the reason that companies have HR in the first place. Phil - this data validates many things we already knew - and kudos for you for calling it out. The HR profession is a sinking ship in the corporate world, afraid to change and afraid to take on new models that threatens its existence. The crux of the matter, is that most HR staff are simply too insecure and largely incapable to take on more strategic duties for their firms. The longer HR resists change, the more it will dwindle in size and effectiveness, until (as you correctly point out), these outsourcing decisions are made for them. The PR analogy is right on the money. Recruiting is all about finding expertise to add value to your talent function on an ongoing basis, which is why it makes sense to develop RPO partnerships, as opposed to wasting money on headhunters and staffing agencies. I feel I ought to come to the defence of some of my HR colleagues. Over the course of time I've met some very focussed, visionary HR leaders who are capable of getting beyond the talk to real actions. Back in late 1990's I had first hand experience of sourcing a tactical RPO service for a major network engineering program. It was simple, effective and took a huge burden of HR generalists in that business. Then in 2003 I worked closely with a RPO "implant" in a multi-national business. The end-to-end process and level of interaction between the Recruiters and inhouse HR was almost seamless. The main constraint being the fact they used a different technology platform and interfaces were rudimentary. I think the main issue now is about uncertainty over hiring volumes. In today's economy no one wants to sign a big RPO deal if the emphasis may be on reductions. A hybrid RPO/Outplacement provider would make sense - Companies can use this partner to flex up or down depending on their needs. Great article. One point that comes out of this research is how HR still has issues thinking of themselves (& acting) as a strategic partner within the executive ranks of a company. Until this mindset changes, HR will continue to not have seat at the table. If the corporate engages in a proper partnership with the RPO then it is a no brainer, of course cost avoidance is a driver to outsource but it the ability to deliver a high touch managed service that delivers Talent faster, better and cheaper than before. Give HR the time and space to achieve strategic goals for the business, by delivering a great resourcing service to the internal stakeholders we raise the profile of HR and effectively create PR for HR to change the way the business feels about the value HR can add to the business. In summary, we help the business realize that hiring and retaining great people is not purely a HR responsibility it is a business responsibility. Key benefits RPO provide Flexibility, scale, expertise and continuous improvement. We ensure that the latest thinking, the latest techniques and the latest methodologies are shared with our clients and become their trusted advisors in the world of resourcing. Also, we give our clients the ability to turn the tap on and off very easily, this is a great benefit not just in times of slow down but. perhaps more importantly to ramp up very quickly when the need arises, the client needs never really changes, the main drivers for organisations to outsource are the ability to 'buy-in' the expertise in resourcing in a way that can be turned on and off. The ability to attract, recruit and retain better talent than their competitors. As the recession lifts there is another dimension and that is that companies have downsized their HR teams and do not want to hire permanent staff whilst they are still unsure which way the economy is going and therefore are looking at the viability of an RPO solution to give them the flexibility. If we are able to get in early and conduct a diagnostic as opposed to responding to strict one dimensional questions in a tender / RFP environment we are always able to be more creative and innovative in our solutions which inevitably provides a much better solution. Seems to me that RPO might be better served by using an ITO solution. Much of the shake/bake screening, combined with pre-employment could be done over the wire. Even having them do a webcam interview would serve as a bit of possible innovation. Then you can apply knowledge processes (or KPO that event). Recruitment shouldn't be part of HR. Recruitment causes HR a lot of pain ...but they fight to hold on to it because it affords them a sense of commercial relevancy. This is perfectly understandable. It should really be a a separate department that reports into Sales & Marketing, with a dotted line into HR. That way, their recruitment process would become more proactive, their brand more compelling and their costs dramatically lower. Candidate quality would improve too. 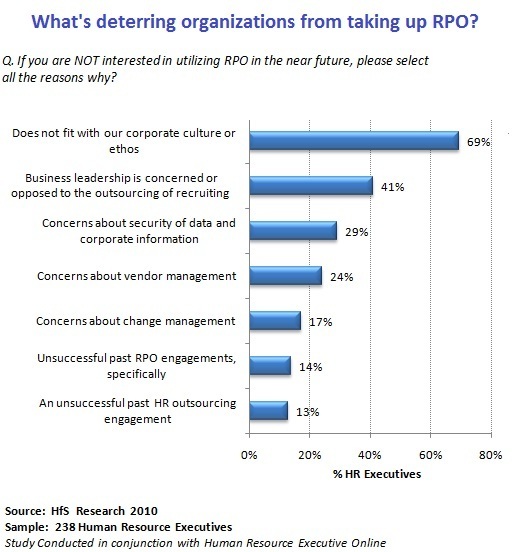 RPO is only really a sensible option for rank and file/volume recruitment. Companies smart enough to put recruitment where it commercially and culturally belongs (in Sales) and brave enough to pay higher salaries to attract the real talent out of the agency/search sector would very soon be in a position to improve candidate quality and reduce agency costs. Recruitment has long been the 'elephant in the room' for many companies and so far, too many corporate senior executives have believed the lies told them by HR and recruitment agencies. If recruitment (particularly at the front end) is really a function of HR, why don't recruitment agencies hire ex HR people, instead of commission hungry young people who are prepared to spend all day on the phone? Perhaps the problem lies in how RPO is perceived. The first generation RPO value proposition is now old hat; lower hiring costs and reduced time to hire. Second generation RPO solutions bridges the gap between efficiency-led outsoucing and an integrated approach to talent management. Here a strategic partner model transfers in knowledge, expertise and resources to ensure effectiveness around a broader talent agenda. Efficiencies will follow. Show me one HR leader who is not interested in this. Great discussion, Phil. Wish you had posted it on the HR Technology Conference LinkedIn group, where you might have gotten more practitioner responses. A few of my own comments. Jim Madden, the Black Magician of Exult, ruined it for everybody in HR-BPO from the get-go, when he took a page out of the IT Outsourcer's playbook and went in over the head of the top HR executives right to the CFO and CEO. Not the best way to win friends and influence people. I won't comment on the nature of his contracts that Hewittt subsequently bought. Second, everyone needs to understand one vital thing about HR. It is about the people in the organization (or organisation, if you insist). As one commenter noted, if HR is not responsible for bringing in the right people for the right jobs, what the hell do we need them for? And I remember well the scope of all the early HR-BPO contracts; they never included recruiting (like at BoA) because that was deemed too strategic. I don't know where that leaves RPO firms, other than handling the hardest to fill positions, just like headhunters are outsourced the job of finding new CEO's or other senior officers. I guess if they show they're better at it, than over-time HR will buy their services more and try to find something more important to do. Lots of suggestions out there for what that should be. Dear Phil, The topic has a great relevance in the competitive and dynamic staffing world. The true issue is about HR actually willing to give away control over non-critical and non-core activities, which is leading to lot of process inefficiency and cost waste at their end. The time has come for HR to realise the quality, speed and cost advantage that a good outsourcer can add with staffing. Enterprise buyers need to find new innovative ways to expand in new geographies, new verticals of business to gain advantage over their competitors, and outsourcing needs to be considered as a partnership to help them achieve that - not simply a vendor/buyer contract.